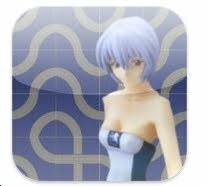 How many puzzle apps use an image of a hot girl as part of their icon? There was another puzzle that involved a maze, but I don't recall the title. 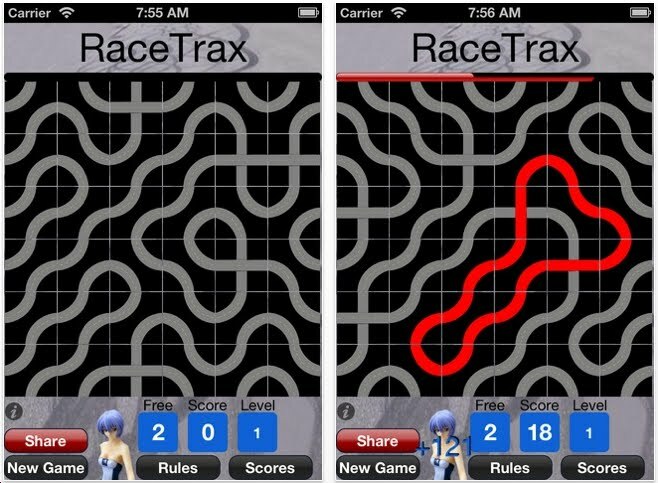 The object of Racetrax is to swap adjacent tiles to form closed loops. The bigger the loop, the more points you get. 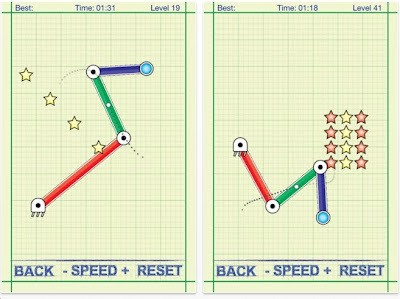 After solving level 4, you get a limited time to play level 5. Then you are asked to pay for all the levels. This is a good puzzle! I played it 4 times. You really have to scrutinize the playing board to figure out what swaps will lead to a closed loop. I may even pay the $.99 to keep playing. But there's a problem with this puzzle. I have no idea how the program determines when I'm done with any level before it advances me. Do I get a limited number of moves? Is there a time element? A scoring issue. On that aspect, this puzzle app is a bit frustrating. Click here for the solution Cast Flag was created by Nob Yoshigahara. The object is to remove the flag. It's kind of easy. Another company ripped him off by making a replica with the slightest of changes. This metal version is quite nice. Just in case you're interested in another social media site, there is now something called pinterest.com. Peter Grabarchuk sent me this link to a group of serious puzzlers. 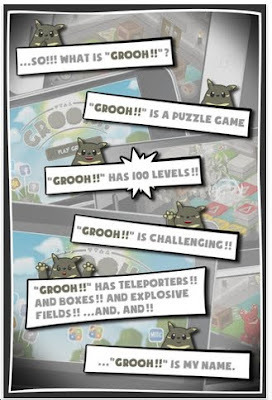 Grooh is similar to Hex-A-Hop, a game I've mentioned several times in the past couple of years. 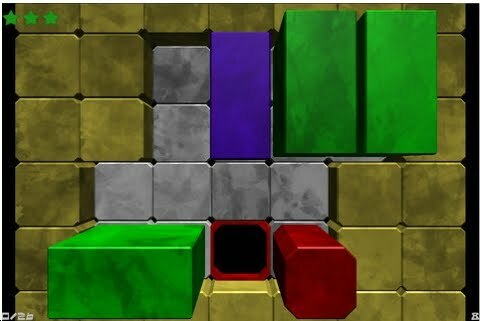 The object is to get to the door while getting all of the colored tiles to explode. How to explode a colored tile: step on it, then absorb its color, then step off. Some tiles are raised. You can pick up boxes to put in holes. There are wormholes. I've been playing this game for a month and am stuck on level 22. 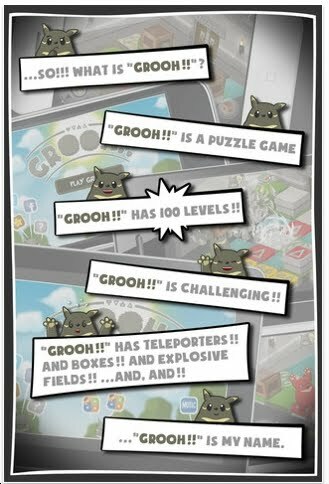 Download Grooh right now and give it a test run. Moovin Up is kind of a tilt maze. The object is to get the cow/s to eat all the grass. We've seen this type of puzzle many times. Here's what's different: 1. The red cows do not eat grass, but they can kick the rocks off the grid. 2. Cows can climb up stairs, but never down. 3. If a cow eats a mushroom, that cow will still travel all the way to the end, but then will fall asleep forever. There are 60 levels. I've done all 60. It's fun! The object of Addidoku is to loop the numbers in the grid into simple adding equations. Look at the picture: 3 + 4 = 7. Also 5 = 5. These puzzles are really fun! Oscar Lindberg is one of the creators of Addidoku. The free portion allowed me to play 5 easy, 5 medium, 5 hard & 5 extreme levels. I didn't hesitate to spend the $.99 for the rest. They're addicting and fun. The easy & medium levels are way too easy. 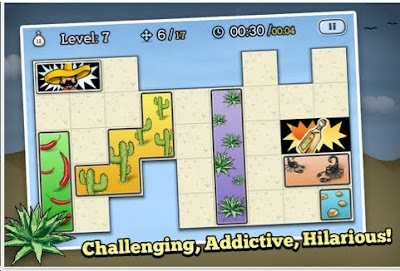 But the hard & extreme levels can be quite tricky. There's usually 1 number that's the key to solving everything. 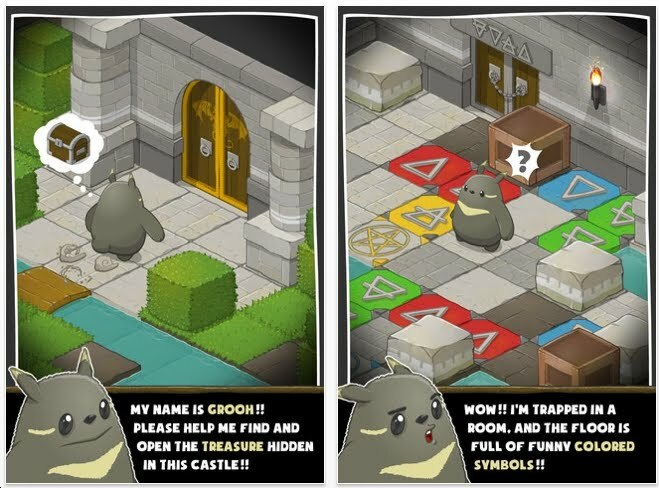 Each level pack has 100 puzzles. The 25 easy levels will take 10 minutes - total time. The 25 medium levels will take 12 minutes. The 25 hard and 25 extreme levels will take 45 minutes - 2 hours. Furthermore, I bought the second level pack for another $.99 and didn't stop until all they were all solved. 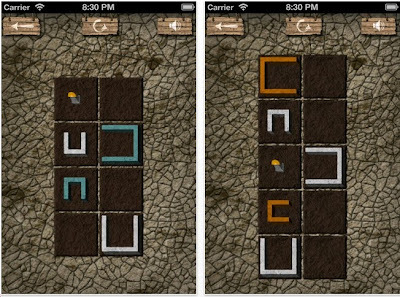 Addidoku is a great puzzle app for people who like Kakuro, Sudoku and Kenken. 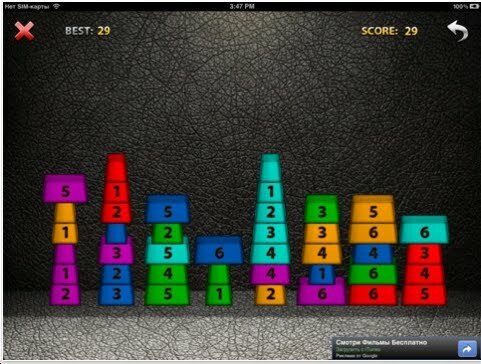 Math teachers: get your students to play it. 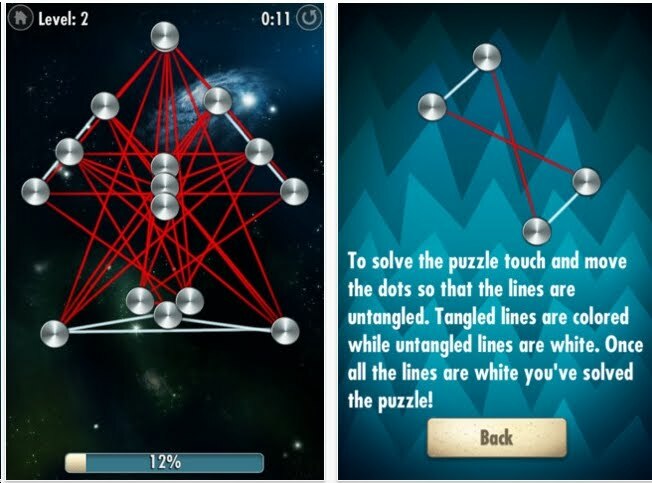 Billy Lavoie recently contacted me about his new puzzle app Tangled. The object is to untangle the cords. Intersecting lines are wrong and turn red. Correct lines turn white. We've seen this app before more than once. I believe Tangled is the only one that has a percent scorecard so you can track your progress for each puzzle. Good fun for kids. 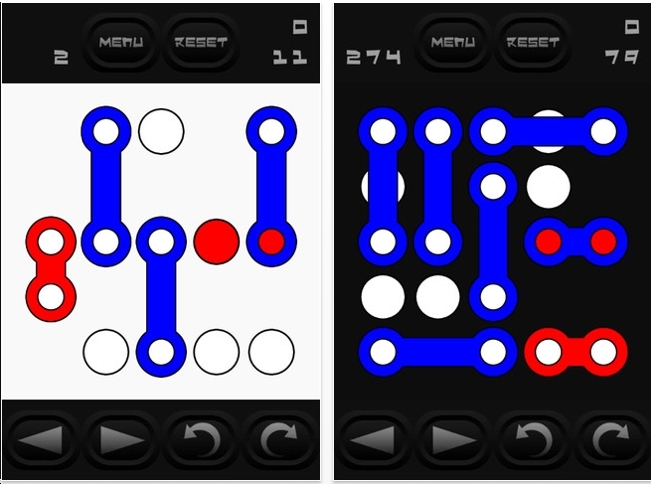 You may recall that I wrote about Pixopush: an interesting puzzle app from a 17-year old. I have finished all 192 levels. Whew! They definitely get more challenging with 2 and 3 cities and complex paths. Click here for the webpage. A lot more complex than the image below. Click here for the solution. 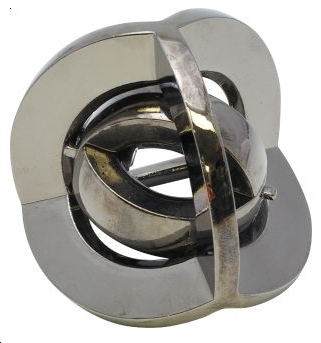 Oskar van Deventer designed this take-apart puzzle. 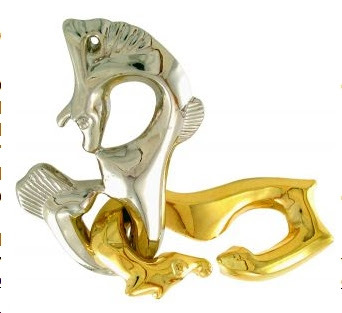 Inside the frame is a ring, which is composed of 2 pieces. The whole solving process is really fun. Do get it. About 10 years ago I got a wooden version of this - crafted beautifully by Tom Lensch. I think I paid $90 for it. This version is metal and much smaller. Kevin Loewke recently contacted me about his mechanical engineering puzzle. The object is to move the blue circle and the semi-circle at the end of the red piece so that the white dot on the green bar will trace a path that will touch each of the stars. I've done the first 7 levels - they are challenging. Level 17: I've tried this and cannot believe that it is possible. Yowsa! Obviously, I don't know much about mechanical engineering and wish that I did. Update: I missed something in the instructions. The red bar and the other bars can be stretched! That changes everything! Last night I completed 22 of the 48 puzzles. Definitely fun. 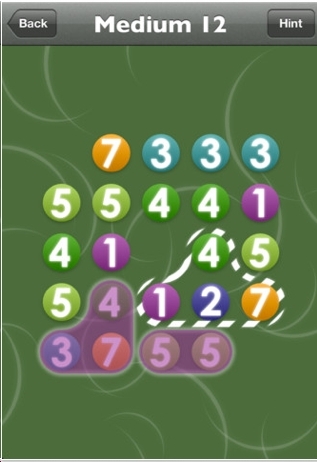 48 levels is just the right number for this puzzle I think.Fans of Angry Birds should like this because it has a fair amount of trial and error. There is a lite version. Give it a shot! Ola Muchachos! 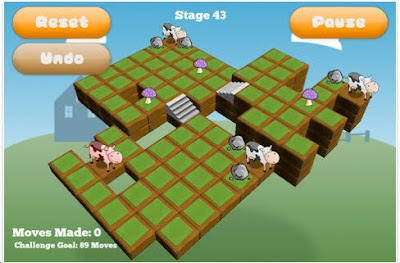 Ehud Zamir recently sent me an email about his Israeli company Artlab, and their new game/puzzle. 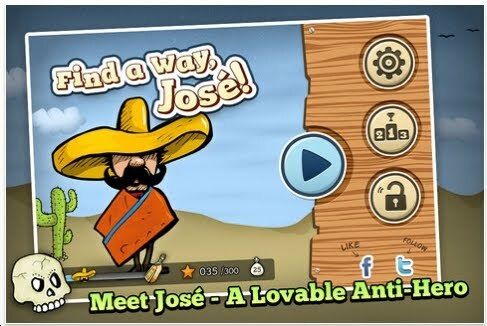 It's a sliding tile puzzle that combines a Mexican who has a distinctive mustache and sombrero and tequila. I'm sure somebody somewhere is offended. I'm here to report on the puzzle aspect only. So don't send me hate-email. The object: slide the tiles around until Jose gets to the bottle of tequila. There are 15 free levels. 60 levels total. After that you can buy more. 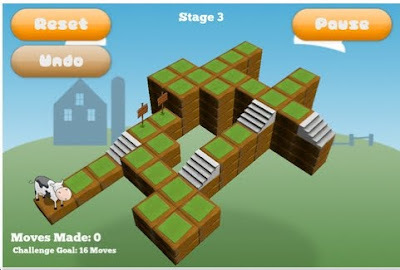 You can also build your own levels. I've solved all the free levels - they're not so easy. The graphics are really good! Combination came out in 2009, but I didn't know about it until recently when one of my blog 'followers' alerted me to it. All I can say is Whoa! Best of all: it is a free puzzle app. This puzzle has 397 levels. The difficulty categories: simple, easy, fun, smooth, tricky, risky, knotty, taxing, tough, baffling, havoc, mayhem, insanity, bedlam, cruel and superhard. 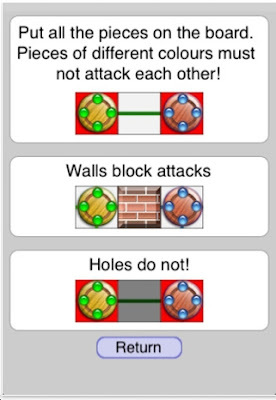 The object is to place the pieces into the grid so that red does not attack any other color except red. Right now I've done more than 150 of the levels. Mostly at the fun, smooth, tricky, risky and knotty levels. These are plain fun! Everybody download it right now, give it a test run and send me an email how you like it. 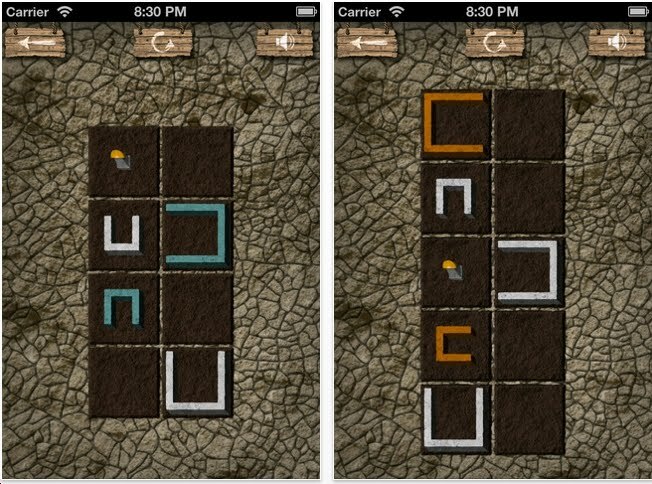 Combination easily makes it onto the list of Best Puzzle Apps of 2012 - even though it came out in 2009. My list, my rules! 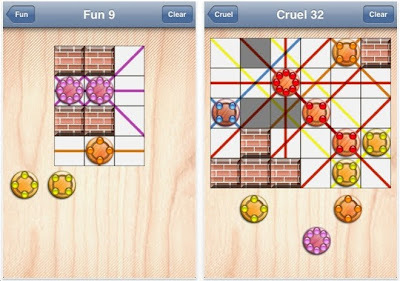 Ivan Vassilev has created some very good, challenging puzzle apps - all within the last 6 months. They are all worthy of your attention. The object here: roll the shapes around so that the red rectangle can fall down the rabbit hole. The gold colored shapes: that's the frame. 200 levels. Right now I've done about 40 of the levels. No way I'll be able to complete these in the next 2 years; they're tough. Ivan has also produced Red Mix, Spin Mix and tJam. My puzzle friend Ivan Vassilev has done it again! First he came out with tjam, which is fabulous and hard. Then Ivan came out with Red Mix, it's also difficult, but maybe not as fabulous as tjam. 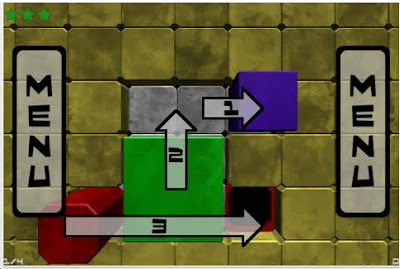 I still haven't mentioned his third puzzle app bloxie, but I will post a review of that in the future. Spin Mix could be the most fun! 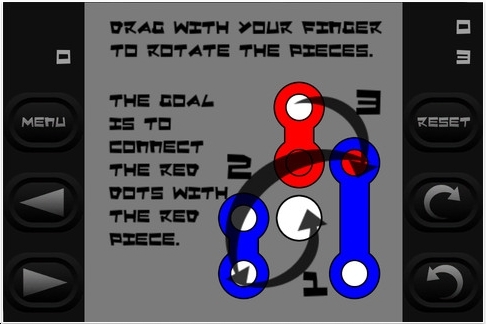 The object is to swivel the blue and red line segments onto the white circles until the red line segment lands on both red circles. Look at the picture below - there are exactly 274 levels. As you can see, there's a good mixture of easy, medium & hard puzzles. 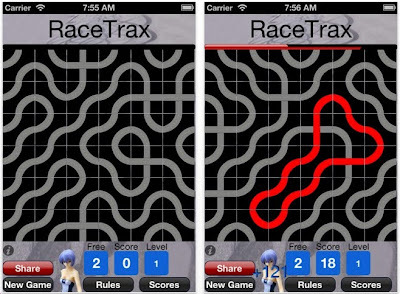 Without a doubt, Spin Mix makes it onto the list of best puzzle apps of 2012. Hexchange is an edge-matching puzzle app. There are 120 levels of placing 7 hexagons into the given field. I've been solving edge-matching puzzles since the late 80's. It's not my favorite genre. This puzzle app does a good job. I solved a few of the puzzle challenges. Then I decided to watch the app solve a puzzle level. It uses a trial and error method and it's really fun to watch! Kris Noland is one of the people behind this project and I hope they expand it. Hey- love your blog- I'm always looking for great new puzzles- thing is I never seem to find them. You've turned me on to quite a few and I appreciate that. I'm writing because I'm wondering if you've ever heard of the game Blobbo. 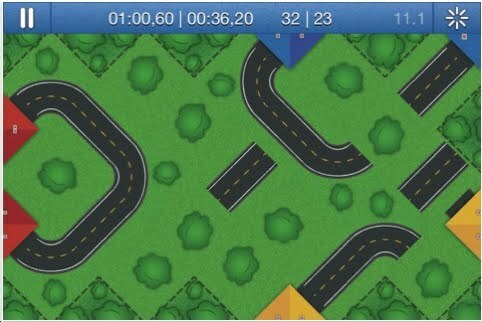 It was an old game on mac that was created by someone named Glen Andreas, and it was my very favorite game EVER! It was perfectly clever, cute, difficult the right way... It really utilized all parts of the brain. I'm always looking to fill the empty hole that Blobbo left but it never seems to happen. Closest I've come lately is a game called Puzzling Penguins 2, but even this one is one dimensional in it's funness. I know there's a name for these types of games... It starts with an S and I always get it mixed up with sudoku ... But I'm wondering if you know of other games that are like this out there..? Thanks for your blog, again... really neat. 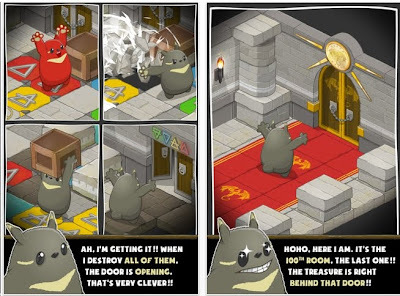 Cracking the Safe is a free puzzle app that's perfect for kids. Since D*B = 8, you then can eliminate 0, 1, 3, 5, 6 from both D & B. You get the idea. There are 25 levels. I've done a few at the beginning and a few at the end. They are all at the same difficulty level. If you are a teacher of mathematics, do give this to your students. Unblock BMW is yet another version of Rush Hour. 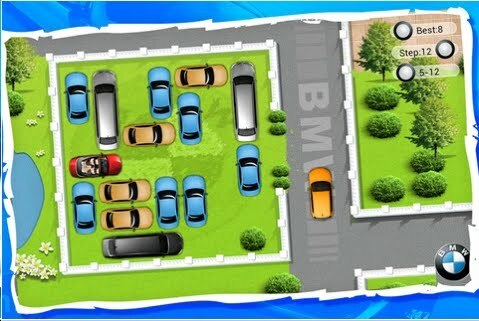 It's a free puzzle app with ads for BMW. 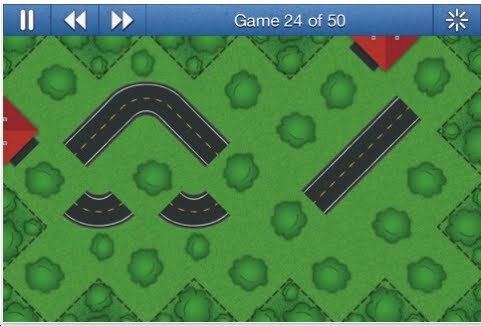 Here's what's interesting: some puzzle levels have bushes that prevent any car from moving onto that square. But it's not interesting enough! A very good alternative is Blockwick, which I reviewed about 3 weeks ago. I was just playing it last night in fact. 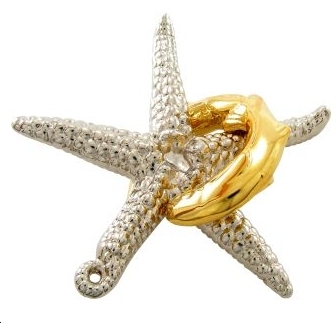 Cast Starfish is yet again another cool disentanglement puzzle that does not use string, rope, wire or rings. Woo! Trust me on this: buy multiple copies: 1 for yourself. 2 to give as gifts. Last summer I brought two similar puzzles to a wedding reception. Needless to say, I was the life of the party - sorry cousin. Jan-Niklas Kohlhaas is a 17 year old who lives in Germany, in a small town in between Frankfurt and Köln (Cologne, for those of you who don't sprechen sie deutsch). Pixopush is his baby! Look at the grid above. It's tilted at a 45 degree angle. The object is to slide rows and columns to transfer sections of road so that the two red square towns can be connected. I've done about 100 of these puzzles. They're not particularly hard. But, there is a time element! Also, the harder levels have a restriction. If you see a white cloud on a square, that means that that row and column is fixed. I will definitely finish all of the levels. 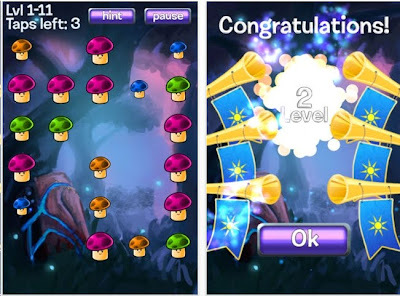 Shrooms is a pure logic, chain - reaction puzzle. Tap a purple shroom and it will vanish & fire 4 bullets - one in each direction. After absorbing a bullet, Blue mushrooms will turn to yellow, then green, then purple and then will disintegrate and fire 4 of their own bullets. I've solved about 75 levels. The game comes with 1100. Users of this will like Fling and Lunar Lockout. Something annoying: the button to restart a puzzle is right next to the advertisement. Boco Free has 5 or 6 free puzzles to solve before purchasing more. 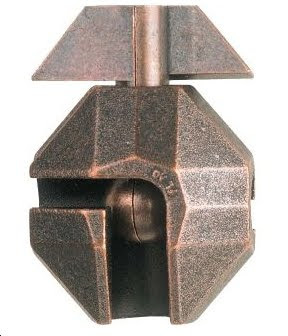 The object is to get the small square into the big U. 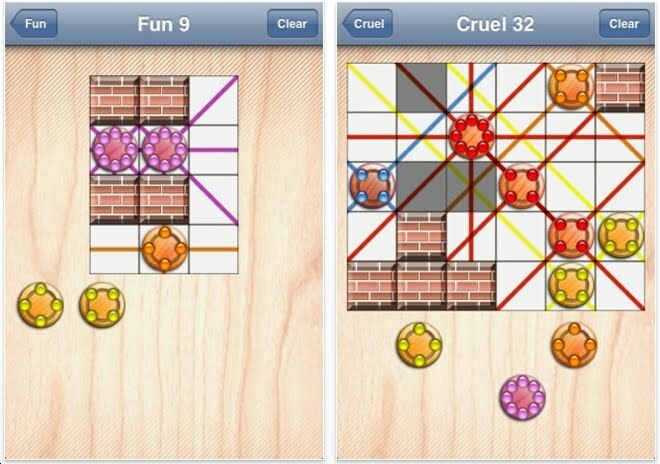 These are interesting, fun puzzles. Just so you know, there's an online version that's completely free called Box Up. Click here to play them. Vadim Bashurov published Bashni about 2 years ago. It's a colored version of the Tower of Hanoi. Now comes Six Towers Plus which is essentially the same thing. There are 12 free levels. 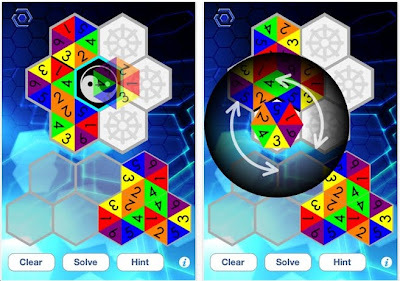 If you solve them, then you get 50 more free levels. Supposedly. I did the 12 free levels but couldn't get the extra levels. You can buy 1,000,000 levels for .99 Pretty good deal I think.